Causality between the ratio of domestic private credit to GDP and growth in real GDP per capita is investigated in a country-by-country time-series framework for 24 OECD economies over the period 1980–2013. The proposed threefold methodology to test for causal linkages integrates (1) lag-augmented VAR Granger causality tests, (2) Breitung–Candelon causality tests in the frequency domain, and (3) testing for causal inference based on a fully modified OLS (FMOLS) approach. For 12 of 24 countries in the sample, the three tests yield uniform results in terms of causality presence (absence) and direction. Causality running from credit depth to economic growth is found for the UK, Australia, Switzerland, and Greece. 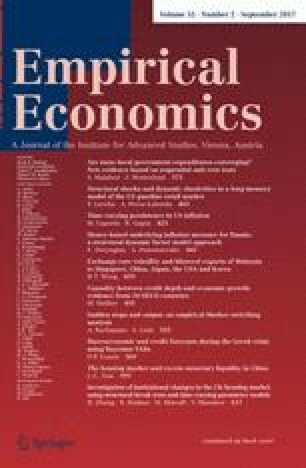 The findings lend no support to the view that financial development shifts from a supply-leading to demand-following pattern as economic development proceeds. The aggregate results mesh well with the current discussion on “too much finance” and disintermediation effects. However, idiosyncratic country determinants also appear significant.